How has your week been? I've been sick all week and finally managed to get out of bed today. 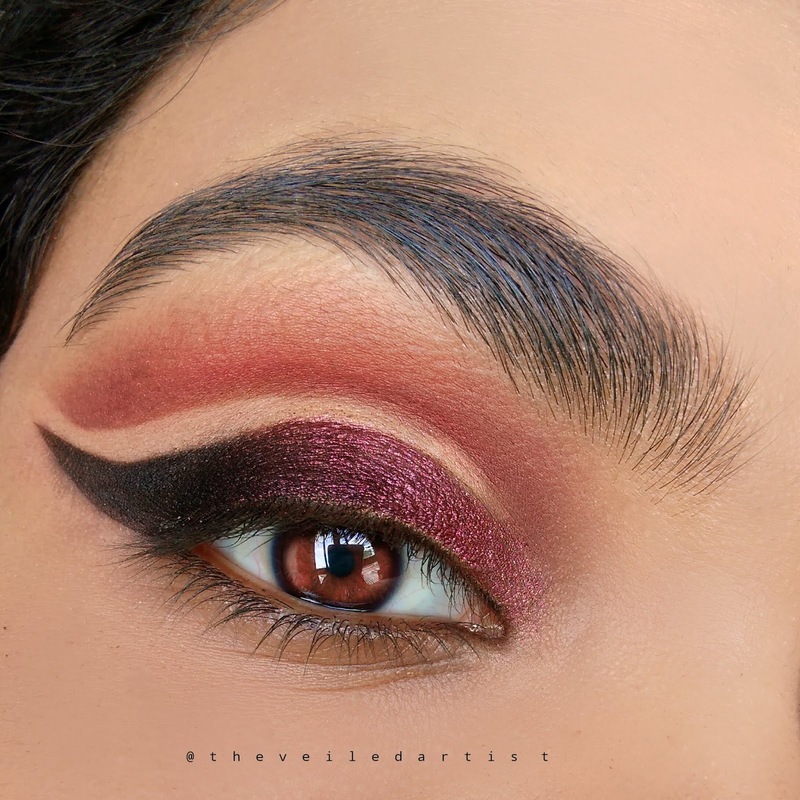 So I'm here with a tutorial on this gorgeous, shimmery burgundy double cut crease look that I had the hardest time photographing since I work with natural light and the lighting KEPT CHANGING haha! So let's get right to it! Blend the matte warm brown eyeshadow into your crease and a little above it. Using your favourite concealer or foundation, carve out the shape of your crease as shown below and then, set this with your favourite setting powder or even a matte eyeshadow that matches the shade of your concealer. 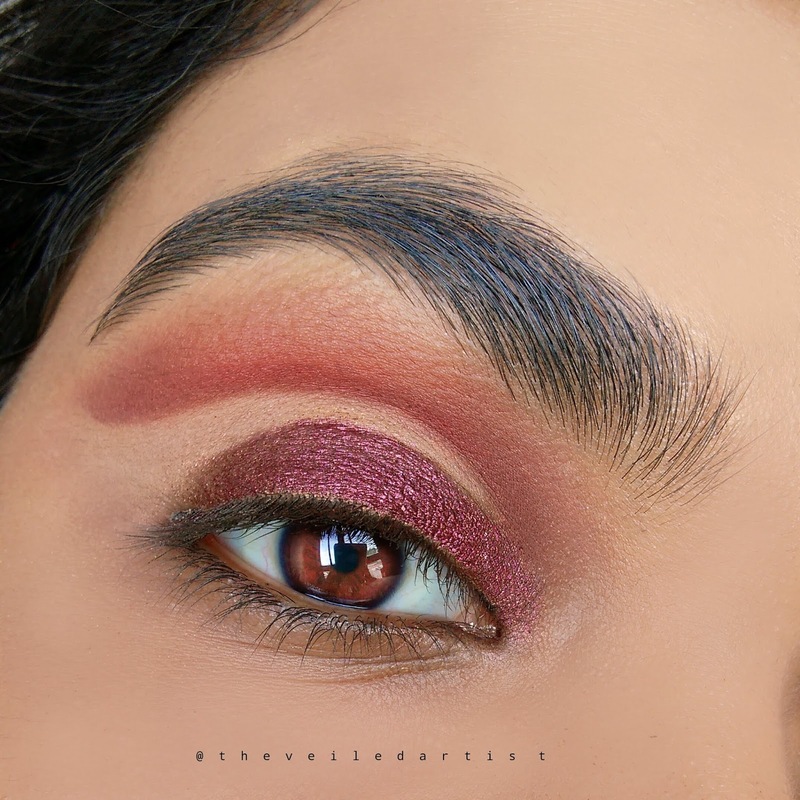 Starting from the inner corner, apply the shimmery burgundy shadow to the inner half of your eyelids, making sure to keep that little space between your crease colour and the shadow on the mobile eyelids clean and shadow-free. 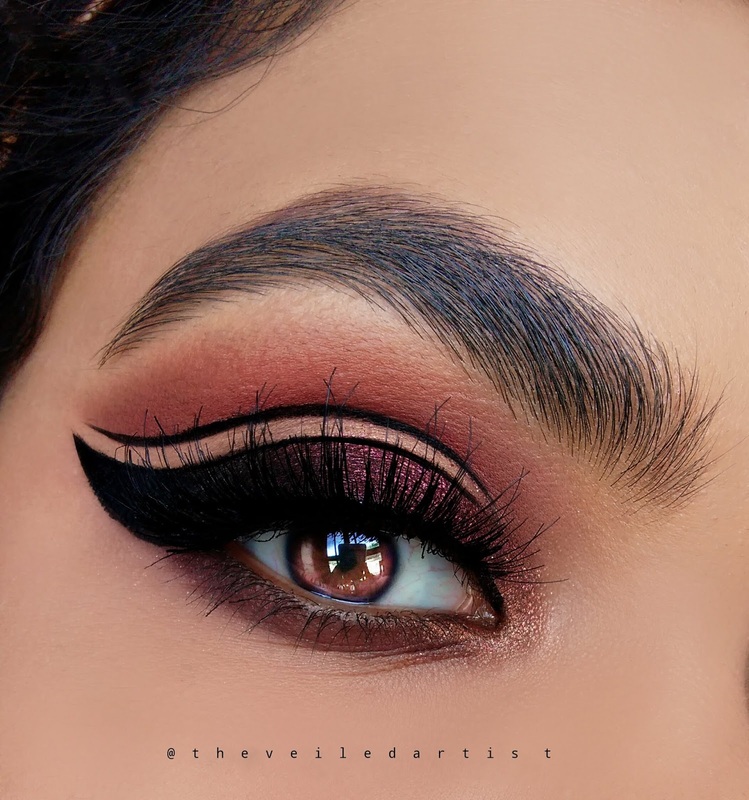 Following the cat eye shape we created in step 2 with concealer, apply the matte black eyeshadow as shown below, blending it into the burgundy we just applied. 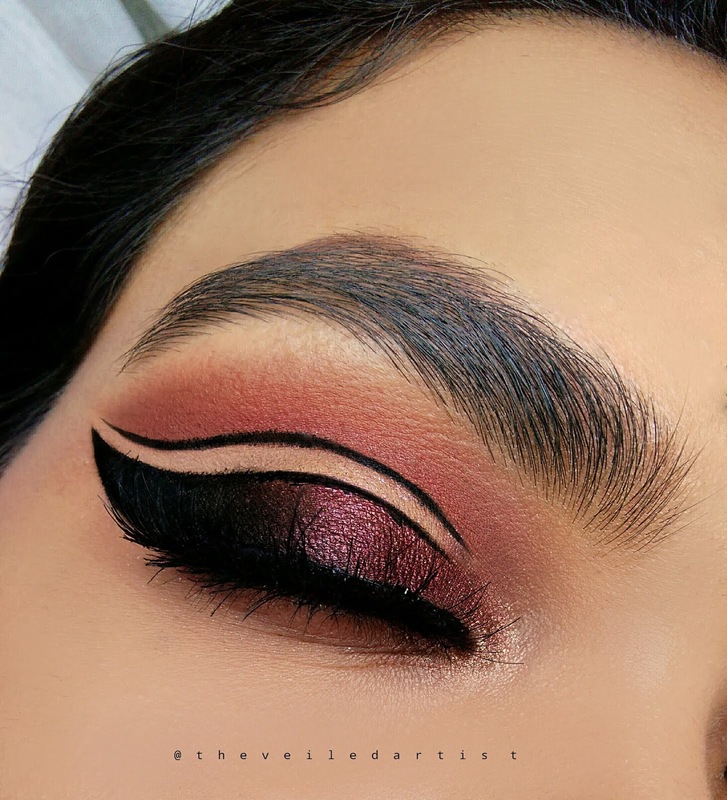 Once you have created a cat eye shape that you are happy with using the black eyeshadow, you can now use a black liquid or gel liner and sharpen and add detail to the very outer parts of your wing and deepen it up. I also decided to line my cut crease lines with the same liner so that everything looks more pronounced. 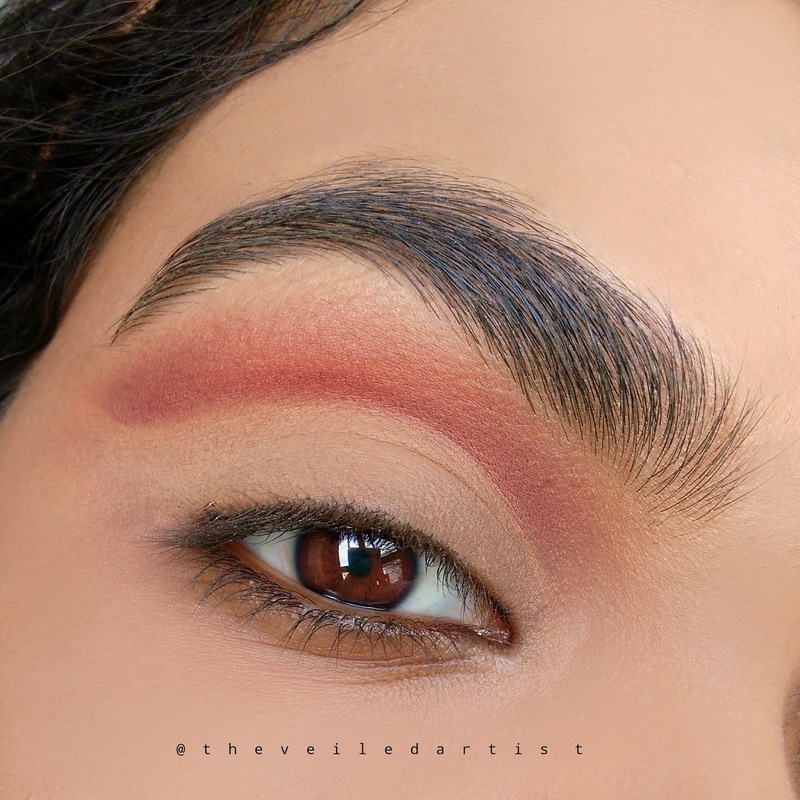 Blend the same warm brown shadow we used in the crease all along your lower lashline and then, apply the rose gold eyeshadow into the inner corners of your eyes, blending it into the shadows on the eyelids and lower lashline. Line your upper lashline, curl your lashes and apply mascara. 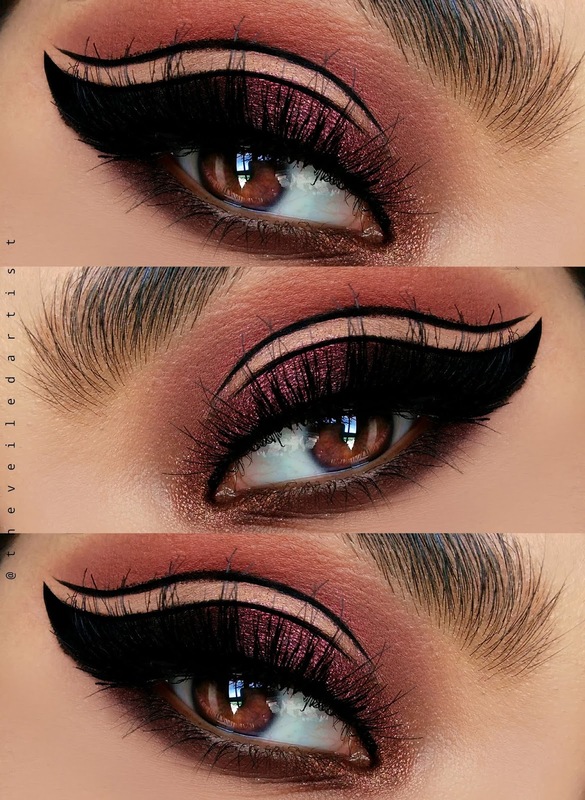 You do not have to worry about creating a wing or finishing up your liner on the outer parts of your eye as we already added that definition in step 5. Finally, add a pair of fluffy and long falsies and you're done my loves!! You could totally rock this look with no lashes but since everything is so dramatic, your natural lashes can sometimes look sparse and adding a nice pair of falsies will help you finish the look off well! Scroll down to see the full list of products I used to create this look! Thank you so much for reading my loves! I really hope you enjoyed this tutorial as much as I enjoyed creating it. I love how this look turned out! You can check out my last post here. I swatched and reviewed a super affordable essence liner that I have been loving for the past few months and it's perfect for the summer heat!